Story added: 13 Aug 2006 20:52. Last updated: 30 Aug 2006 12:31. It's not just LG's KG800 Chocolate phone that offers a buttonless front display, now Samsung has waded it with its E900 effort. But can the South Korean manufacturer behind the hugely popular D600 model steal the show? We get dialling to find out. The E900 is a a Tri-Band GSM (900/1800/1900MHz) EDGE phone with GPRS capabilities and remarkably very much like the D600 in its ethos as it is the Chocolate phone in its design. The phone offers a limited feature set on the top of the model, while a quick slide of the display reveals a keypad hidden underneath. However rather than a big bulky design, the E900 is considerably thinner than the D600 and this is mainly due to the lack of buttons on the front of the phone as well as some other behind the scenes changes. Where the D600 featured rather clunky buttons on the front of the slider design, on the E900 they have been replaced by touch sensitive ones and means that you merely have to press the casing to access the function you want rather than an actual button. Unfortunately Samsung hasn't taken this perhaps as far as it could have in our mind, so a key dpad and OK button are still present. Slide the bright crisp 2-inch 240x320 262K Colour TFT screen back and you are presented with a small, but easy to use keypad with no additional buttons - these are on top. Realising that any phone with either a camera or MP3 player must have direct access buttons, Samsung has tucked these out of the way on the side of the handset. Featuring a 2 megapixel camera, the E900 is keen to promote itself as more than just a phone images can be stored on either the phone's internal 80MB memory or directly on to an optional micro SD slot. However it's not all good news. For some reason there is a slight delay in pressing the button to activate the camera and the software actually loading. This slowness is certainly noticeable against other Samsung models we've tested, most specifically the D600. The slowness also affects the shutter lag on the camera and in our tests we noticed that it took a long time to take an image after we pressed the shutter button. Of course taking photographs isn't all the E900 can do and taking advantage of its internal memory and micro SD slot the phone also features a MP3 player and speaker so you can share the love. The player supports all the usual suspects including MP3/AAC/ACC+/AAC+(e)/WM playback and you can transfer tracks to the phone via bluetooth or USB. It might be a copycat, but its still likely to be one of "The" phones of the year. 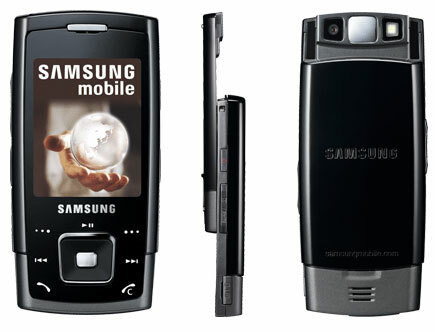 As the successor to the D600 the E900 ticks all the boxes, the interface although retro in its design is easy to use and will be second nature to other Samsung users, who liked the idea of the chocolate phone however weren't too sure of the interface. As for a style icon, like the Chocolate phone, the SGH-E900 does a good job, the touch sensitive screens passed the wow factor down the pub, while the large screen meant seeing anything you're doing also got the thumbs up. However where the Samsung E900 wins out is its feature set: 2 megapixels compared to 1.3, in-built loud speaker and like the D600 a TV out connection to share photos and video with others. The review was provided by www.Pocket-lint.co.uk the leading website for gadget news and reviews in the UK. For more mobile phone reviews, click here. Zombies, vampipres and more! Zig Zag Zombie released on App Store Goal Defense is currently free for iOS Get Groovy with GAMEVIL�s New TouchMix FX Snoopy's Street Fair passes five million downloads on iOS "PandaBoy: Challenge Accepted" Game for iOS Launches in August! App name - Project Boom Rise of the Warriors - The Chaos Invasion, New MMORPG game Available for iOS Gamers THIS GAME HAS NOTHING TO DO WITH LONDON 2012 Ad Hoc News: Exclusive Galaxy on Fire 2 HD - Sale! Owls - a fun matching game for children of all ages.